Trampoline users There are 58 products. This trampoline with safety enclosure is especially designed for children 12 months of age! This completely safe space lets your little one discover the joys of jumping. Round Black Booster 300 trampoline with safety enclosure. Its long springs allow users to accomplish a variety of technical jumps. Manufactured with high-quality materials, this trampoline is built to last. The 10ft Black Booster Trampoline 300 is perfect for teenagers looking for excitment! Available in a maxi pack, it is delivered with a safety enclosure, an anchor kit, a ladder and a premium protective cover. Apollo Sport 300 trampoline available in maxi pack with all the essential accessories: the trampoline, an enclosure, a ladder, an anchor kit and a premium protective cover! Large, rectangular recreational trampoline measuring 500 cm in diameter. Its large jumping mat allows for intensive use by thrill-seeking athletes as well as non-athletes (teens or adults). 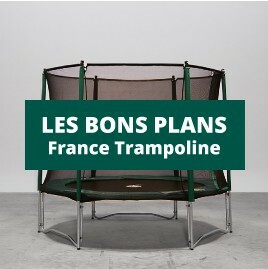 This round, family sized trampoline of 3.05 m will allow you to optimise the space in your garden.